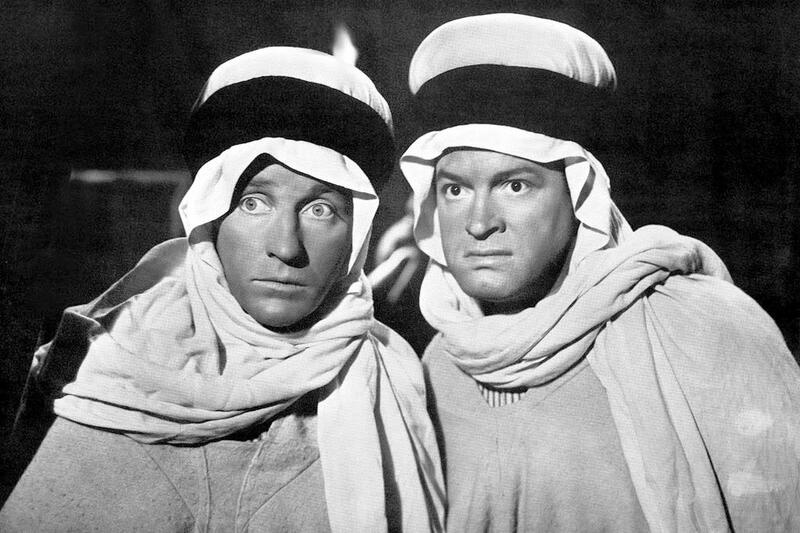 ROAD TO MOROCCO was the third of seven ‘Road’ flix with Bing & Bob, and the most successful of the whole profitable lot. It came in 7th among 1942 releases, and if you adjust its grosses for inflation you’ll see it making around $246 million. It was the highest rung ever for Hope, theatrically, whereas Der Bingle had seven films that surpassed this in popularity. 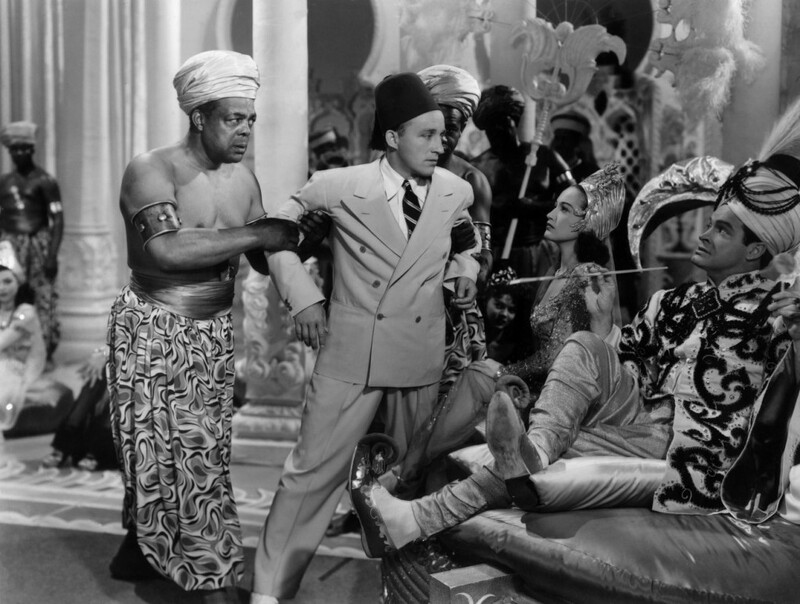 Following the template set by Road to Singapore (1940) and Road to Zanzibar (1941), this zippy silliness finds the two buddies alternately insulting and saving each other through nonsensical situations in absurd representations of exotic locales. Since they were topical, a lot of the gags are way past their due-date, but a fair amount still deliver chuckles, and the timing of the two friends is terrific. As with their contemporaries Abbott & Costello, and stepchildren Martin & Lewis, one of the pair (Crosby) appears to have a bit more on the ball brains-wise, with Hope doing more of the clowning (plus, Bing has to croon periodically). It’s a pretty democratic split (for two Republicans), and they complement each other like gloves. They do the ‘patty-cake’ routine (which kids, once upon a time, found riotously fun to re-enact), and Hope inaugurates ‘breaking the 4th wall’ by talking directly to the audience. Shipwrecked! Hey, we’re in North Africa! Princess in danger! 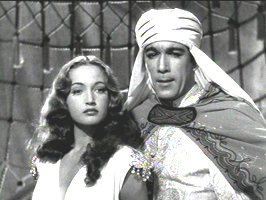 (Dorothy Lamour,trying her best to keep up with the guys improvised ad-libs) Bad sheik! (Anthony Quinn). Directed by David Butler, pattering-by wisely at only 82 minutes, it drew Oscar nominations for Screenplay and Sound. Featuring Dona Drake, Vladimir Sokoloff and an unbilled Yvonne De Carlo as one of Dorothy’s handmaidens. Road to Utopia followed four years later. Unless you’re a strict completist, twenty minutes of any of these fondly remembered yet dated farces is enough to get the drift, have a laugh or four, and move on. Typical topical gag. Here is Richard Loo in a bit as a radio announcer. It is 19 & 42, see…..